MARC STEINER: Welcome to The Real News. I’m Mark Steiner. Good to have you all with us once again. Food stamps have been a political football for a long, long time. From Reagan talking about “welfare queens” in Cadillacs, to Clinton cutting food stamps for able-bodied adults after three months, to Trump’s war on food stamps that heighten and tighten what Clinton did in an even greater degree for three quarters of a million people to stop them from being able to get food stamps. These, the rich people call ABAWDs. That’s what they call them, this federal nomenclature, this bureaucratic nomenclature, “Able-bodied Adults Without Dependents.” So this is a complex question, though, involving the war on the poor. Almost half of all these folks are white and white men at that, most of whom, many of whom, some of whom, voted for Trump. But most importantly, it’s the piecemeal dismantling of any aid for the working poor in our country that’s taking place in front of our eyes. The Republicans couldn’t get this in the last farm bill in December, so now Trump is making this a federal regulation. Joining us today is Chuck Collins, who is Director of the Program on Inequality and the Common Good at the Institute for Policy Studies where he coedits Inequality.org. Chuck, welcome back. Great to have you with us. CHUCK COLLINS: Thanks for having me, Mark. MARC STEINER: So let’s talk for a minute about exactly what’s happening here. I’m curious of couple things: a) how it differs from what Clinton did in the 90s when he started throwing people out of this same program, to the farm bill where they couldn’t get this in the farm bill, to what the Trump administration just did. So what are we witnessing here? CHUCK COLLINS: Well I think the continuity is the symbolic attack on the so-called able-bodied people without dependents, who seemingly are sitting in hammocks and collecting public benefits. And Trump’s maneuver was essentially an end run around Congress so this is an attempt to defy the will of Congress, just like building a wall. He’s going to kind of get at his. But I think it’s sort of a symbolic attack to kind of go after this sort of mythology of permanent dependence, as opposed to really understanding who is it that uses food stamp, how do they use them, when do they use them, and why they’re necessary. MARC STEINER: Well I want your answer to that question in just a second. I want first for you and our viewers to see this piece. This is Secretary of Agriculture Perdue and what he had to say about these men and women who are receiving these food stamps. SONNY PERDUE: We believe the purpose of our welfare system should help people to become independent rather than a permanent dependency. We believe it does this with six and a half million people unemployed and over 7 million jobs out there. 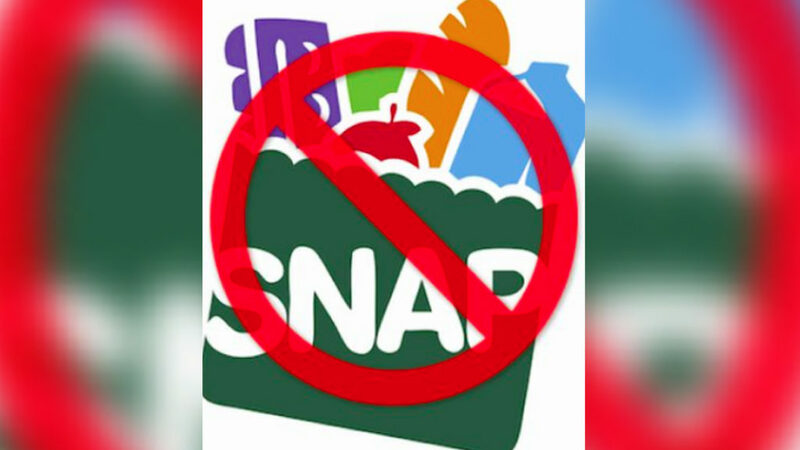 We think, again, from the 20-hour week of training, or volunteer even, or working, if people have a job, they still qualify for SNAP. They’ll still be eligible to get food assistance in that way so we think we’re helping people to, again, move into the dignity of work and the respect of providing for their families. MARC STEINER: So this is part and parcel, Chuck, in many ways of this mythology– at least some people think there is a mythology around– that if you give somebody food stamps, they’re not going to work. It makes people lazy. CHUCK COLLINS: All right. First, there’s absolutely no proof that people getting food stamps, that that discourages them from looking for work or finding work. It also just defies the fact that many of the people who get food stamps are working. They often are doing seasonal work sometimes or they’re in rural areas where they’re not able to secure full-time work. We’re talking about average food stamp benefits of $126 a month or, like a $1.40 per meal. So usually, we’re talking about people who are supplementing, already working, or going to food pantries. And my experience of who’s on food stamps, these are elderly folks, they’re in rural areas, they’re veterans, they’re people with criminal records that make it hard for them to get [queries] and get certain kinds of jobs. There are a number of barriers. It’s just not the sort of simplistic idea that some people are just sitting around choosing not to work. Most people would like to work and for whatever reason aren’t always able to do that. MARC STEINER: And I think that this also feeds into this whole stereotype about who is on food stamps, who gets the food stamps at $150 a month, whatever that number is most people get. MARC STEINER: And it feeds in many ways into this racist view of America of lazy Black folks, lazy people of color, lazy Black women, who will not get up and work. I mean, these racist stereotypes are part of what push this political agenda. CHUCK COLLINS: And you mentioned going back to Bill Clinton, if you think about the general relief, many states used to actually have general relief for single individual adults who were in need. There has been this decades of systematic attack and shrinking welfare benefits and yet, we’re still relying on the same old tired canard of a myth to shrink benefits. That there’s somehow this little segment and as you said, Mark, these are largely rural and white men. The largest percentage of beneficiaries are in those communities. And in a lot of rural areas, full-time work is not as easy to come by, even in a low unemployment rate. So go to Maine, go to northern New England, go to the northern Midwest. These are folks who are working seasonal jobs when they can and they’re going on food stamps to get through the winter, in some cases. MARC STEINER: You’re seeing that there’s another chart that shows that 48 percent of people who receive food stamps are white and mostly men. These are important things, I think, for Americans to put their heads around who’s actually getting food stamps and why. And I am curious what’s different between what you’re seeing Trump and his administration doing now, and what was originally done by Clinton? How is this heightening what’s happening to the problem? CHUCK COLLINS: Well I think that in some ways there’s a continuity, which is the power of the myth of deservedness– who deserves help? Where it’s really interesting is that huge numbers of people have actually been lopped off of welfare since Clinton; the 1994 so-called, welfare reform acts. You know, the number of people. We’re talking about four million people on food stamps of which 750,000 apparently fall into this category of the able-bodied. We’re just talking about shrinking numbers of people. Yet, the mythology seems amped up and how do you justify shrinking government? That’s really the agenda that’s being pushed here. How do you justify that and continue to sort of focus on this sort of mythological person of color, who is able-bodied, who is choosing not to work as opposed to can’t find work for various legitimate reasons? MARC STEINER: And you’re seeing in all of this also that this is being shoved back to the states and saying that the rules that they wanted to implement, in terms of percentages of unemployment, is also being changed so that it’s even more difficult for people to get food stamps than ever before, if this is allowed to go through. CHUCK COLLINS: Yeah and the proposal here is that there be a work requirement, or a requirement to volunteer, or that you’re in 20 hours a week of job training. And states vary widely in terms of their capacity to sort of even absorb that or provide for that. So once again, it’s this kind of ideological proposal that doesn’t really have a basis in what states are doing in practice, or able to do. MARC STEINER: Let me play this short clip from Fox News and I want to talk about the political ramifications after you watch this. What is the political struggle that will be around this particular issue? FOX NEWS ANCHOR: Having work requirements for welfare or food stamps, however you want to benefit whether it’s housing or something else, doesn’t that enable people to get out of poverty rather than stay in it? LAWRENCE JONES III [FOX NEWS]: Well I know a lot of people on the Left want to trap people in this because they will have their voting base and they don’t have to work to actually focus on the issues that affect average-day Americans. But the fact of the matter is this, a lot of these policies have affected my community, personally. Many of the people in my community end up staying on these programs because it’s a trap. It’s a government trap to keep them in there. That’s why the original program was to allow people to have some form of assistance, get a leg up, and not be trapped on it forever. MARC STEINER: A couple of things here. One, this is what I’m talking about the popular mythology being pushed here on Fox by this fellow Lawrence Jones, and other people who do their commentary, in talking about what the origins of food stamps were in the 60s. Why they came to exist is not what they’re putting on the table as to why they exist and how they’re supposed to operate. CHUCK COLLINS: Let’s also remember some of the root to food stamps was in the USDA. It’s actually sort of a program to subsidize the farm sector and agricultural producers, so let’s go back to the real driving energy here. But it’s just simply not true that people stay on food stamps for long periods of time. That’s again, the myth overriding the evidence. The evidence is people go on and off. Most people are employed. They have a rough patch and they get food stamps. It’s a supplement; it’s not a replacement. Most people want to work and will and are working to try to meet their needs. And frankly, the food stamps aren’t enough to allow anybody just to live without putting something else together. So it’s just the myth trumping the reality, again and again. MARC STEINER: So finally, Chuck, I’m curious what you think happens now. What is the political battle that’s going to take place both on Capitol Hill and the larger struggle around this? How do you think this plays into what we’re facing in 2020 and what we’re facing right now on Capitol Hill? MARC STEINER: So can this be stopped? Can Trump’s push here to accentuate what Clinton already did, can it be stopped or is it a fait accompli? CHUCK COLLINS: I think Congress could stop it. I think the states could refuse to implement it, if this actually is a directive that comes down. Again, it’s going to be this conflict between a president who’s trying to do an end run around the will of Congress. But I think it could be stopped through congressional action. MARC STEINER: Well, Chuck Collins, its always great talking to you. We appreciate the work you do and appreciate you taking time with us here on The Real News. Chuck Collins is Director of the Program on Inequality and the Common Good at the Institute for Policy Studies and joins us frequently. And Chuck, thanks so much for joining us once again. It’s always great to have you with us. MARC STEINER: Thank you for joining us on The Real News Network.